The GAGAN (GPS Aided Geo Augmented Navigation) system is a Space Based Augmentation System (SBAS) developed jointly by AAI and ISRO to deploy and certify an operational SBAS for the Indian Flight Information Region (FIR). GAGAN provides a civil aeronautical navigation signal consistent with International Civil Aviation Organization (ICAO) Standards and Recommended Practices (SARPs) as established by the Global Navigation Satellite System (GNSS) Panel. GAGAN system provides NPA (Non Precision Approach) services of RNP-0.1 over Indian FIR and PA (Precision Approach) services of APV-1.0/APV-1.5 (AProach with Vertical guidance) over Indian landmass with effect from December 30, 2013 and May 19, 2015 respectively. Although primarily meant for Civil Aviation, the GAGAN signal can be used by a vast majority of civilian and non-aviation users. GAGAN will provide benefits beyond aviation to many other user segments such as intelligent transportation, maritime, highways, railways, surveying, geodesy, precision agriculture, security agencies, telecom industry, personal users of position location services etc in the Indian subcontinent. The applications of GAGAN to various users are enabled through GAGAN broadcast messages via the GEO satellites GSAT-8 and GSAT-10. A new messaging service is being proposed through GAGAN by using the available bandwidth in the broadcast message. GAMES will make it possible to send additional text messages that could cater to early warning messages on the occurrence of natural disasters, calamities, dangers for the safety of life within GAGAN coverage area . The Search and Rescue Messages and associated relief and mitigation related messages, Meteorological information, Alert messages about storms, avalanche etc could be broadcast through GAMES. The Asia-Pacific region has had to cope with an unprecedented number of disasters. People of the Asia-Pacific region are four times more likely to be affected by natural disasters than those living in Africa, and 25 times more likely than those living in Europe or North America – and while the region generated only one quarter of the world’s GDP, it accounted for a staggering 85 per cent of deaths and 38 per cent of global economic losses during 1980-2009. In addition to the growing exposure to disasters, the increasing socio-economic losses due to disasters should also be recognized. The Asia-Pacific region is very prone to disasters caused by natural hazards. These include droughts, floods, storms, extreme temperatures and wildfires, as well as mass movements such as landslides, volcanoes, earthquakes, avalanches and tsunamis. According to the International Disaster Database, between 1980-1989 and 1999-2009, the number of disaster events reported globally increased from 1,690 to 3,886 and the trend seems to continue. Over the whole period of 1980- 2009, 45 per cent of these were in Asia and the Pacific. 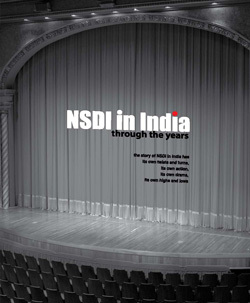 India ranks second in the number of disasters and number of people affected in the Asia-Pacific regions. Development of new opportunities for reducing risks and making disaster recovery resilient – an opportunity that is often overlooked, is the need of the hour together with improving the use of emerging technologies for more effective and efficient disaster management before and aftermath of the disaster. Timely provision of effective information allows people exposed to hazard to take appropriate action to avoid or reduce the risk and prepare better for effective response. A variety of techniques have evolved over time to alert the general public, administrative authorities and/or response personnel to an imminent or ongoing danger or potential emergency situation. Typically, warnings are issued in case of significant natural or man-made crises that could lead to loss of life or property. The current early warning systems use one of the following communication methods (Figure 1) to broadcast the messages. The deficiencies in the existing dissemination methods such as providing the information in a delayed manner and over a shorter area are to be overcome and ensure that the early warning/ alert messages reach a large number of users within the shortest time period. Satellite systems present a distinctive and efficient solution to the delivery of one-to-many messages. In order to reach the maximum number of people in the target area with a reliable information service, a specific technical solution has to be evolved. GAGAN will provide an excellent opportunity to send alert messages and early warning messages through its GEO broadcast reaching wider area within shortest possible time. • The GAMES (GAGAN Message Service) concept is concerned with the provision of early warning/Alert messages to all concerned citizens or governmental/local authorities in case of a major event or disaster. As GAGAN foot-print covers a vast area from South Africa to Australia it can be utilized very effectively in the Asia Pacific region to broadcast short service messages. Knowing the area/location of the possible disaster or event, which is possibly available with agencies like the NDMA (National Disaster Management Authority), Meteorology Department, INCOIS, SASE, etc, the people living in those areas could be warned through GAGAN message broadcast. The data related to nature of disaster, longevity of catastrophe, expected area of disturbance etc., can be fetched from relevant agency and broadcast through GAGAN GEO satellite to reach out all over the GEO coverage area. The satellite based system offers number of advantages for real-time disaster alerts over the current methods due to faster, reliable delivery and wider coverage. 1) GAGAN Alert messages with location information can be used effectively by the user to identify whether his area is affected or not. 2) The service can cover wider area because of the larger GEO broadcast foot-print, global reception of the signal and no limitation in the number of people who can use the signal simultaneously. 3) The messages can be received even when terrestrial communications infrastructure is damaged or not available. – Also, with the availability of L5 in future, the spare capacity will be enhanced allowing for larger data capacity. 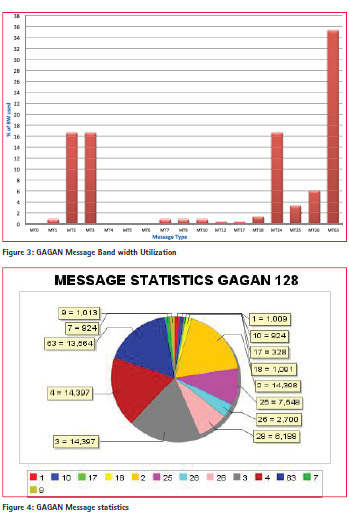 GAGAN has the availability of free bandwidth of about 75bps out of 250bps and the message statistics of the GAGAN broadcast shows(Figure 4)that about 13000 null messages (Message Type 63) are being sent whenever no other messages are scheduled, every day. These null message slots can be effectively utilized to transmit short text message information for providing emergency service alerts throughout the GEO footprint.Through MT63 – appr. 250 characters /min per satellite can be transmitted and usable throughout India and the neighboring countries by mobile phone users and anyone else with an SBAS enabled GPS sensor which is configured to read MT-63. The ICAO SARPS makes very little reference to the format and function of message type 63 stating only that “SBAS may broadcast null messages (Type 63 messages) in each time slot for which no other data are broadcast.” The data link is designed to broadcast a valid message every second to provide a continuity of signal using message type 63 to fill space if no other message is available. 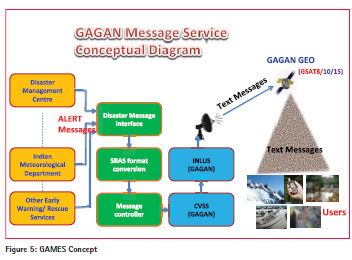 By adding few components to the existing GAGAN system as shown in Figure 5, short messages can be broadcast over Indian region. GAMES will consist of three segments namely the Message Control segment, the Space segment and the User segment. A typical working scenario is described very briefly here. This segment consists of, the Message generation, transmission and monitoring systems. The information generated by MGS is sent to Message Controller within the GAGANINMCC for further processing. The short message is broken up into number of frames by the Message controller for dissemination through GAGAN system. The message controller also verifies that the messages are broadcast correctly through feedback mechanism. The alert text messages are added into the GAGAN message structure and forwarded to INLUS (Indian Land Up Link System) for up-linking to GEO Satellite. The user segment consists of common public in affected areas, fisher man, travelers, hikers, users in high seas, etc. The user equipment available today discards the Null message (MT63) and do not examine its contents. The GAGAN enabled receiver which is configured to read the MT63, will receive the L1 signal from GEO satellites, process it, extracts the ALERT/EARLY WARNING TEXT Messages and display the same. Also the user receiver, being an SBAS compatible, gives the current precise location of the user from which the identification of whether the user is currently in the affected area or not is possible. Separate Apps can be developed to extract these Alert/ Early warning messages from GAGAN signal through mobile phones, dongles, hand held receivers etc and provide the information in the required format in local language. It may be noted that the aviation receivers will not utilize this capability as MT63 is ignored by them. 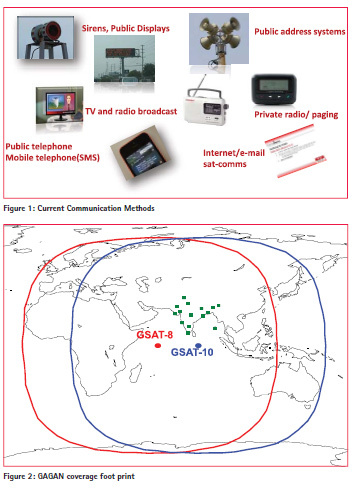 This paper presented the new approach to broadcast Early Warning/Alert messages through GEO satellites over a wide area to alleviate the last mile communication issues to remote locations and high seas through cost effective and efficient means. GAMES is a free to air service and any user equipped with GAGAN receiver with minor software modification will receive alert messages along with precise position information. Since GAGAN is basically a Safety of Life (SoL) system, the service availability is ensured all the time in all weather condition. As GAGAN system is operated and maintained by AAI, there is better control over message services. GAMES will be able support many types of alert messages simultaneously without the requirement of any additional infrastructure.